Happy New Year! Let us hope 2012 brings happiness to us all. 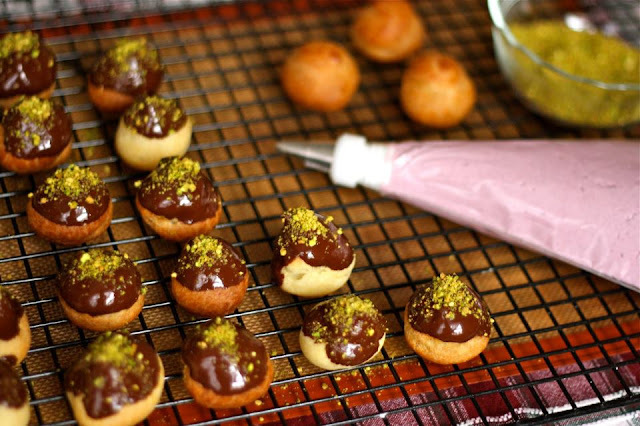 I rung in the new year with these little fellows: flaky profiteroles filled with blackberry mascarpone, dipped in chocolate, and sprinkled with pistachio. I love the colors and the flavors in this dessert. I hope that you'll give them a try sometime this year. Take care, and best wishes and blessings! In a small bowl, whisk together the flour and salt. Bring the water to a boil in a medium-size saucepan over medium-high heat. Add the butter. When the butter has melted, add the flour mixture all at once and stir vigorously. Cook and stir until the mixture forms a ball that doesn’t separate. Remove from the heat and cool slightly (about 1 minute). Add the eggs, one at a time, beating after each one until the dough is smooth. Drop heaping tablespoons of dough about 2-inches apart onto a lined baking sheet. Or transfer the batter to a pastry bag with a round tip and pipe circles about 2-inches in diameter and about 1-inch apart onto lined baking sheets. Bake the puffs for about 30 minutes until they are golden brown and puffy. If the puffs are medium-size, bake for about 25 minutes, and if the puffs are mini-size, bake for about 20 minutes. Remove the cream puffs from the oven and cool on a cooling rack. Place blackberries, orange zest, orange juice, and sugar in a saucepan over low heat. Mash blackberries as they cook down. Leave on low for 15 minutes. Strain blackberry mixture through a fine mesh sieve. Let cool. With an electric mixer on low speed, combine mascarpone, confectioners' sugar, and the blackberry mixture until combined. Melt 8 ounces of chocolate on a double broiler. Grind 1/4 cup shelled pistachios into a fine powder. Pipe blackberry mascarpone into the profiteroles. Dip tops of profiteroles in melted chocolate and immediately sprinkle with pistachios. Let chocolate cool and harden. Can be stored in an air tight container in the refrigerator for up to 3 days. These are not only creative, but gorgeous! The gloss on the chocolate topped with the bright green of the pistachio is really stunning. I may just have to dig out my pastry bag for these. Sounds like the PERFECT way to celebrate the start of a new year! Love the ground pistachio on these...beautiful! Omg that blackberry mascarpone filling looks amazing! I love the pistachios on top too - so beautiful and delicious looking! These are beyond delightful! I am crazy about these flavor combinations, and they are oh so pretty! These look beautiful and I love the flavors too. Yum! These look so good, I love the blackberry filling!!! Beautiful. These are absolutely darling! I love all things miniature. The blackberry mascarpone filling is very inspired :-) Happy New Year to you, too! SUPER festive and SUPER cute. The pistachios are really pretty! I love the look of your cream puffs! They look amazing and so beautiful! these look so delish. I am sitting here wishing I could pop a couple in my mouth. Thanks for sharing.